For over 100 years, the Orchard at Altapass has been providing bushels of delicious, homegrown apples to families and visitors from the Southeast and travelers on the NC Blue Ridge Parkway. Over the years, the farm changed hands a few times, and it is now a large Appalachian Cultural Center and a place where children of all ages come to enjoy themselves picking apples, taking a hayride and hearing stories of the Blue Ridge Mountains. Located only twenty miles from the Switzerland Inn, Mount Mitchell is a must see when visiting Little Switzerland. There are a few places in the world that still stand apart from the ordinary. Rising more than a mile high, surrounded by the gentle mist of low-hanging clouds, Mount Mitchell State Park is one of these extraordinary places. 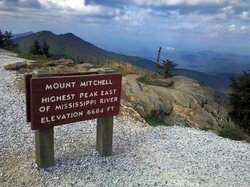 In the crest of the timeworn Black Mountains lies the summit of Mount Mitchell, at an elevation 6,684 feet it is the highest point east of the Mississippi. For those who ascend this mighty peak, what looms in the horizon is a feast for the eyes--breathtaking views of the Blue Ridge Mountains, rolling ridges and fertile valleys. Forested and forever misty, 1,946-acre Mount Mitchell State Park will provide you with some of the most tranquil moments you'll ever experience. The Switzerland Inn is the closest accommodation to Mount Mitchell. 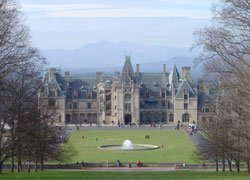 Visit the Biltmore Estate in Asheville for a great day trip! Located just a short drive away from Little Switzerland NC in Asheville, the Biltmore House is America’s largest home and a National Historic Landmark. The Biltmore Estate was built between 1888 and 1898 by George Washington Vanderbilt. The estate features themed gardens, a working winery, turn-of-the-century green house and a large equestrian center in addition to the 175,000 square foot home. Nestled on 8,000 acres, the home was once surrounded by 125,000 acres of preserved lands. The grounds and forests at the Biltmore Estate are well maintained and preserved and much of the land can be accessed via paved walking paths. Most of the home is open for public tours. Special behind the scenes tours are also available. Summer concert series. Linville Gorge NC Wilderness region is part of the preserved and federally managed Pisgah National Forest. Formed by Jonas Ridge to the east and Linville Mountain to the west, over 12,000 acres are considered some of the most beautiful and unspoiled along the Blue Ridge Parkway. Meandering through the Linville Valley is the Linville River, bordered by Gingercake, Hawksbill and Table Rock mountains. 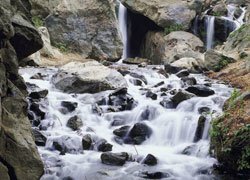 Falling from elevations upwards of 4,120 feet, the clear mountain water originates at the top of Grandfather Mountain. Much of the Linville Gorge Wilderness region is forest, however there are many bare, rugged rock formations which entice hikers and rock climbing enthusiasts.